Lille Åmose bog on West Zealand has proved to be a treasure trove where some of the most important Neolithic sacrificial offerings in Denmark have been found. 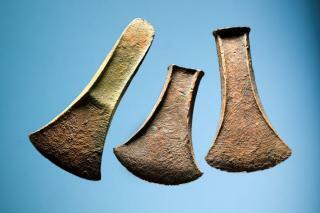 A number of Bronze Age and Iron Age offerings have also been found in the bog. These include axes, clay pots and jewellery as well as the skeletons of cattle and humans. Similar offerings have been found in other Danish bogs, such as Store Åmose and Tissø, which border on Lille Åmose. The objects found in Tissø show that the inhabitants continued their heathen tradition of making sacrifices into the early Middle Ages, even though the country had officially become Christian. Many Danes with a passion for the past dream of finding a beautifully knapped flint axe. Poet Jeppe Aakjær wrote about this in his song about the deepest well giving the clearest water: We seek traces of families in things large and small, in flint axes after the harrows teeth, in the rough and raw jewellery found in the bog." Such objects are usually found in bogs. This was where prehistoric man sacrificed important things to supernatural powers. Despite many years as a professional archaeologist, finding a fine stone axe in Lille Åmose was a very special experience. Considering the bog's history, it's hardly surprising that the object was found just here. Many others have experienced a similar thrill of finding a relic in this atmospheric wetland area. After all, it was used for sacrificial offerings for at least three millenniums of prehistory. "